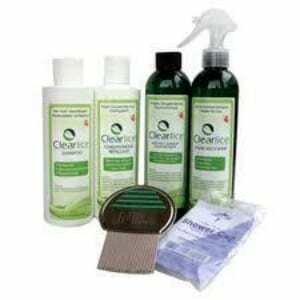 Clearlice: Is This Really an All Natural Head Lice and Nit Treatment? Clearlice says that it can work on lice in the first day that you apply it. This can sound like a blessing if you have been trying remedy after remedy with no luck, or if the problem has dragged out for weeks. But how did they come about this solution, and how can you be sure that it will work on your family? If you buy in to the backstory, this came about by the founder’s kid getting head lice, and after weeks of treatment with over the counter medication they still had the problem. So he set off to find a better solution, employed the help of his chemist friend, and two years later this was born. Clearlice says that it is doesn’t use a pesticide the way many of the products out there do. And even without resorting to these sort of chemicals they have been able to develop a product that gets rid of lice and nits the first day you use it. They also claim that even if you’ve used a bunch of other treatments before, that this will work on the most stubborn lice. At the same time it kills the lice, it’s also being nice to your hair. After all, you’re not waging war on the hair, just the lice that are residing in it. They say it not only rids you of lice from the head, but also around the home with their survival kit. It’s not every day that you come across an all natural remedy for head lice, and he does bring up the point that lice can become immune to the chemicals and ingredients that are in OTC treatments because they often don’t kill the lice eggs, so the next generation is battle ready for what you’re going to use on them. He says that with his formula lice can’t build up a tolerance to it, which is why it kills off all generations of lice and does it’s job from the start. You can’t hype up a lice infestation. They are gross and will make your kid the social pariah at school, even at a young age. You don’t want your kid to be the one that has cooties, there are better ways to build character. Clearlice is $75 for a complete kit that covers one sufferer and a small home, or $105 for four sufferers and a big house. We like that they’ve included this in a kit that covers all of your bases, because when you’re fighting lice you have to fight them on all fronts. They’ll quickly move from head to head by being transferred through bedding, sofas, couches, chairs, and clothing. Eradicate all of their domiciles with a comprehensive kit. We like when a company includes the word unconditional in their guarantee, because that’s the way it should be. This means that there’s no reason they won’t accept your return, you can even not like the way it smells, or not like the packaging, if you don’t want to keep it you can send it back for a refund. You have to resolve yourself to staying with this problem until it is nixed. The lice won’t relent, so if you do they’ll win. The only way they can win is if you quit trying, so even if you have tried a lot of different tips and tricks, you can’t give up until they’re gone. We really like that Clearlice doesn’t use any pesticides. This is really the best of both worlds because you are getting the pesticide-free nature of a lice comb, plus the effectiveness of a shampoo. Because they don’t use any harsh chemicals, your kid’s scalp doesn’t get all itchy and irritated. This means that you can apply it without them putting up much of a fuss, during or after. One feature that shouldn’t be overlooked is that this doesn’t contain any sodium laurel sulfates which are actually used in some lice treatments, and also double as shark repellent. This is also pH balanced so you know it’s not going to cause any trouble to the scalp and hair. While the FDA doesn’t give it’s approval to these sort of products, it’s nice to know that they went ahead and had their lab certified by the FDA for quality standards. It’s the extra step that is so rare for companies these days to take, and it provides some reassurance that you’re buying from a company you can trust. Clearlice is doing a lot of things right, and is the kind of company you feel good buying from. We like that they don’t want your money if their product doesn’t work, but what we like better is the high probability that it will work. We’re giving this our Thumbs Up rating and advice you to try it if you haven’t had success with any other method yet. We recommend getting one of their complete kits, which can vary with the number of people that have them, and the size of your home. This has been designed not only to treat the lice on your head, but also to effectively eliminate them throughout the home so that you don’t have a re-infestation. By following the included directions with each piece of the kit you’ll be well on your way to a lice-free head and home. What do you think? Does Clearlice work or not? I had lice as a child – more than once. What can I say: I was a very sociable child! I didn’t know the little creepers can be found on things like couches or chairs. I thought they only reside in the hair. It makes sense they can also be found where you lay your head. I just never thought that far. Doh! Do you know if Clearlice is distributed within the UK? Also, I always assumed every product has a 30-day money-back guarantee by default. Wrong assumption I guess. I have 3 children (2 girls and a boy). We had lice for 4 months in our home, and could not get rid of them. As a last resort, we bought Clearlice and after one treatment killed the lice and the nits. Thank God for Clearlice. They are heaven sent. I wish we had used this product first. We would have saved ourselves a huge head ache, and a lot of money! We ordered from their website and they delivered it to us here in the UK. It only took 4 days to get here, and yes, they do have a money back guarantee. It is 60 days. I really need an alternative lice removal medication because the one that I’m using right now isn’t so effective. Another problem is that my kid finds it extremely itchy and sometimes he says it hurts really bad. The fact that Clearlice doesn’t use pesticide is a big plus for a parent and it really puts my mind at ease using this product since they’ve certified their lab to the FDA quality standards. $100 is a small investment for my child’s health, I’m just happy I found this product. My kids are grown now, but I remember when they were little and got lice. It is so much work to get rid of it and it cost a fortune. You have to do the treatments, then wash and dry everything in your home. What a headache. If this would have been around when my kids were little I would have bought it. It may be a bit costly, but if it works after one treatment, then you are money ahead. There is nothing worse then getting that letter from your child’s school informing you that your child has lice. Well I wish I could say clear lice worked for us but it didn’t. Not the shampoo or the repel products. What I did like was the conditioner as it made combing through the hair with the pic much easier. My advice, save on everything else and just use the conditioner after you have treated the hair with another product. This is obviously just an advertisement by the people that sell clearlice. No review of the product, no outcomes of tests. Any product that claims natural and what it does, but not the ingredients is a scam. They are not trying to keep a secret some magic ingredients, since if this was so fantastic, and a competitor wanted to duplicate the results, a chemical analysis would tell them all they needed to know, keeping it off the website only keep potential buyers in the dark. Just like the rest, it the only part that works is applying a lubricant substance and is completely dependendent on how thorough the parent is pulling the comb through to get every lice and every nit. nobody, go to Clearlice website. They DO tell what the ingredients are. …what did you buy @ Target??? Doesn’t work!!! …and by the time you get your bottles it’s not enough time to try it for 30 days. By the time the second batch hatches and lays eggs your 3 week trail (not 30 days)… Is up!!! Good luck getting anyone on the phone who will honor your return!!? We used it a second time and still didn’t work until I bought a cheap spray from target, and they are finally gone for 1/10th of the price in 1 shot. It also kills Lice and nits in a 1 time use100% garentied. $10 a bottle with an unlimited return policy, all natural, and doesn’t burn or irritate like Clearlice did. Peppermint oil is very irritating when you have little bites. Also the only active ingredient is just salt when you look up the definition. Make a salt slurry and try that. Use a good conditioner and comb out….probably similar results. Mark — What product from Target did you try, with such success??? Thanks! company that sells it is all about the money. charge $29.00 overnight shipping and when it wasn’t here on time they said oh well. so do i get a partial refund cause it was late- NO – after they charge your card they don’t want to talk to you. they won’t post anything but carefully selected reviews on their website so you will not see anything except what they want you to see. they go out of their way to avoid dealing with any questions after they get your money. buy a different product. I tried it about a year ago after months of fighting with head lice! It worked the first time around. Not sure if it was the shampoo or the hours of combing I spent doing. I bought the jumbo pack with all the different things (shampoo, conditioner, laundry additive, household spray, and comb). Didn’t really need all the fancy things, only the shampoo. So when my daughter brought it home again, I only ordered the shampoo. I can buy cheap conditioner, wash my bedding in hot water, and vacuum beds and such. It’s a good product, just a bit pricey. So far so good for me. This was my 3rd time having lice… It has been about a day after the treatment, and so far so good! No signs of lice, however I’m still itchy. I believe it is from the bites, but I don’t know. NIX and RID didn’t work for me. So far I’d recommend clearlice. Good luck! I used the product exactly as instructed. Did NOT work at all. In fact I used it twice in one week and my daughters hair was totally infested a couple days later. Seemed like it made it worse. I tried to leave a n honest review on their website but strangely couldn’t do it! Don’t waste your money! Used the household spray all of it hasn’t worked at all. Not a happy customer.